I know. I’m a bit late with my New Year’s thoughts. There are some bloggers, whom I greatly envy, that are wonderfully skillful at persuading their brains to transition into Christmas mode in October, and have already wrapped their heads around the passing year long before New Year’s Eve actually rolls around. I am not one of them. I’m sure you have noticed. Though I had intended to try and organize my thoughts over a week ago, my contemplation did not begin until December 31st. Since then, I have been thinking much about 2015. So many moments turned into hours, turned into days, turned into hazy memories. I learned that I like traveling alone, but that my ability for getting lost only increases in a new city. I learned how to make slushies at home. Life saver / figure destroyer. I learned that my boyfriend is a great help in the kitchen, but that he will eat all the white chocolate. Most of all, I learned to let go. As a born planner, letting go of my dreams and plans has never been an easy task. I had lots of dreams that were incredibly important to me and many of them have been given up this year. Sometimes it took a bit of hard force to loosen my grip, and sometimes, I let go freely. Because, though each one of them sounded perfectly wonderful, allowing life to just happen can be the most exciting form of living. When that tenacious, stubborn grip was finally loosened, I was able to embrace so many avenues that were impossibilities before. That is what I learned this year and, I can honestly say that I am the happiest I have ever been in my 21 years upon this earth. Now that is something to hold on to. I decided to do a bit of reminiscing and think back on my very favorite recipes from the past year. Spoiler alert: there’s going to be a lot of carbs. I’ve mentioned it far too many times already, but this Watermelon & Raspberry Lemon Slushie was definitely one of my favorite recipes of 2015. I cannot wait until Watermelon is back in season so I can once again drink these all day long. Another product of my Thirsty Friday series, this Toasted Coconut Fudge Malt was ahhhmazing. Incredibly rich and nutty, this malt outshines all other malts. On one of my first dates with my now fiancé, these Black Cherry Almond Muffins with Cinnamon Streusel Topping made up our lunch. We were on our way to a concert and he was gushing about the muffins and I realized once again why I love baking. It’s so good to watch someone you love enjoy what you’ve made. This brittle. Oh, this brittle. Only half of it ever made it into the bath of white chocolate. That is what happens when you put a chocolate-lover in charge of dipping. Oh well. It was still good. When I dreamed up this Eggnog Custard Pie for a collaboration with World Market, I thought it would be good, but I had no idea just how good. You just have to try it and experience what it is like to be smacked in the face with the eggnogiest eggnog you have ever tasted. It's caramel corn with a whole bunch of snacky, crunchy, salty stuff mixed in. Call your sister and pop in a movie. Whatever the season, it is time to set aside all inhibitions and destroy a batch of this Autumn Caramel Corn. 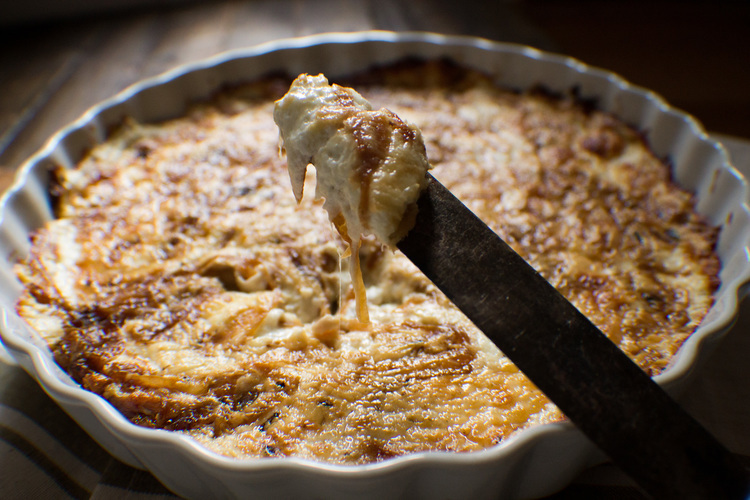 I ended up eating the entire recipe of this Baked Caramelized Onion and Chèvre Dip alone and I did not complain one bit. Forget the stuffed bears and chocolates, give me a toasted baguette and a pan full of hot, creamy, melty cheese and I will love you forever. These were a mid-afternoon craving gone terribly right. Cupcakes. Cheesecake. Strawberries. Bam! So, so good. You should ask your friend to make these Strawberry Cheesecake Cupcakes for your next birthday. Or, you could make them for yourself and avoid all obligations to share. So much changed on my blog this past year and I am so thankful to each and every one of you who takes time to read my words each week. It means so much. I have been given some thrilling opportunities to work with other food enthusiasts over the past several months, and I am so excited to see what 2016 will bring! Without you, my readers, these opportunities would not have been possible. I am so thankful to be able to do what I love each and every week.